Several years ago when I started this blog, someone asked me what I use to brush my teeth, since I was "so green and all." My reply, "some green brand from my health food store that's fluoride-free." Their response, "Oh you could just make your own you know, it would save you money and you could control ALL the ingredients." At that time in my green journey, I looked at that comment and laughed, "Me? Make my own toothpaste? Yeah right! Why make my own when I could buy a green, healthy brand at my health food store?" Fast forward a few years later to now and my opinion has completely changed, I now ask myself, "Why NOT make my own toothpaste?" I've made my own deodorant, shampoo and conditioner, and my own hair gel, what's stopping me?! Isn't it funny how you grow and change on your green journey? One minute you think you've done all you can do to green your home, your body, your baby and then you read something and everything changes. You're on to the next area, the next toxin to clear out, the next DIY recipe...it's definently a journey. So if you're feeling ready, tag along with me and let's learn how to make our own toothpaste. So you're probably thinking what's wrong with my current toothpaste? It's approved by the American Dental Association, my dentist tells me to use it, and the commercials show all the germ-killing powers it has. Well, that's all nice and lovely, but as with most not-so-healthy products, it's all in the ingredients. Saving you from reading all those hard to pronounce chemicals and preservatives, I'll keep this simple. 1. Fluoride-flouride has been linked to lower child IQ's, causing thyroid issues, and it can even cause cancer. Ever wonder why it says on your tube of toothpaste: "Do Not Swallow!" Yeah, along with the other toxins in there, fluoride would be the one you definetly don't want to swallow. Read more here. 2. Sodium Lauryl Sulfate (SLS)- now SLS and I go way back, remember this post about my favorite green alternative to toxic soap? (Dr. Bronner's Castile Soap) Well, SLS is back...in our toothpaste! As well as triclosan, another nasty I mentioned in that soap post. But SLS is what gives toothpaste it's nice bubbly and sudsy action that we've all come to know and think we love, but SLS has a dark side. It's a known carcinogen, and can cause developmental and reproductive toxicity, read more here. In case you were wondering, triclosan, pronounced (try-clo-san) is registered by the EPA as pesticide, and we're putting it where? In our mouth, give me a break! Now you could try and find a toothpaste out there that is without fluoride, and maybe even SLS, but glycerin...that's a tough one. But why waste your time reading labels, when you could just stick it to the system completely and make your own? (Something I love to do!). Now this recipe is not my own and I don't pretend to have created it. Sometimes a stoke of green genius comes to us and we can create our very own, fabulous recipes, but when it came down to homemade toothpaste, I tried a number of recipes, tried a few of my own and every time ended up back at this awesome recipe. The recipe comes from the blog, Crunchy Catholic Momma and the recipe is called, "Non-Toxic Toothpaste." I highly recommend you check it out. I'm simply passing it on since this is the one toothpaste I can't live without! The ingredients needed for homemade toothpaste. 1. 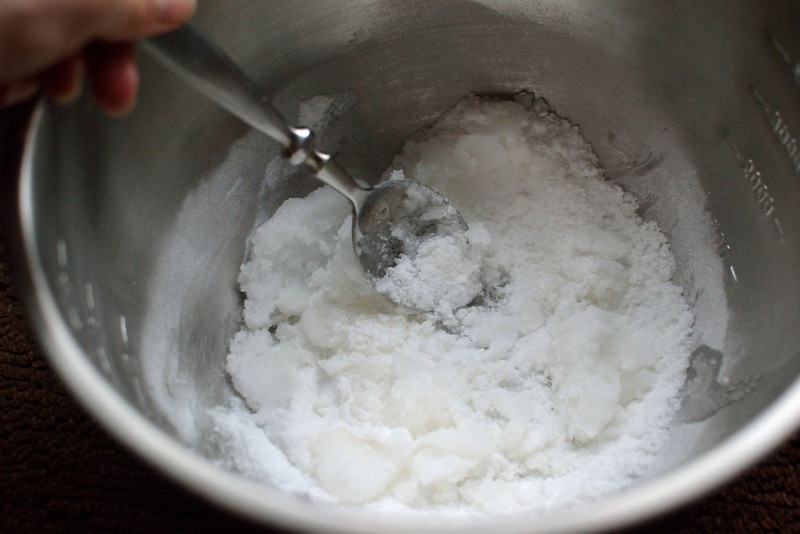 Baking soda- This will provide you with the cleansing effect that we want to accomplish when brushing our teeth. 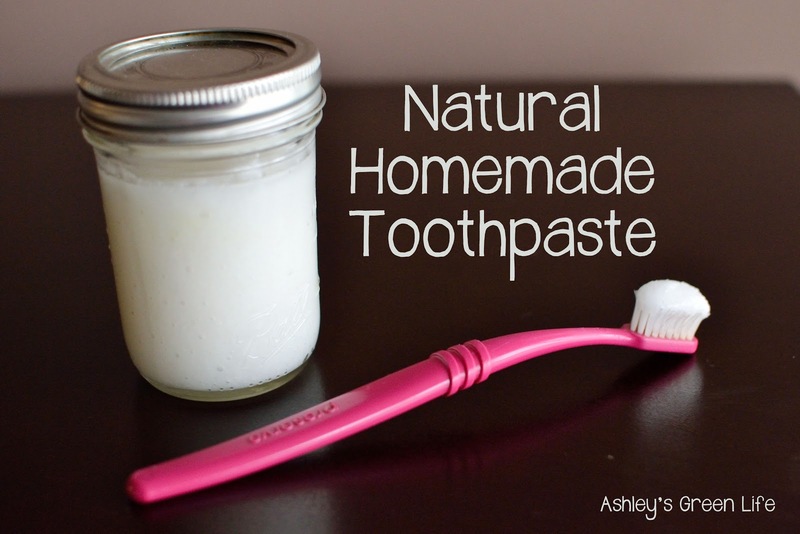 Now I've read some homemade toothpaste recipes that shy away from baking soda because they say it is too abrasive. Some use Bentonite clay instead. Personally I love how incredibly smooth and clean it makes my teeth, and when I've tried other "less-harsh" recipes my teeth still didn't feel as clean, so I'm sticking with the baking soda. Here's an interesting link to a list called the "Abrasive Index of Common Toothpastes" where you can see how most toothpastes rank in abrasiveness. Just plain baking soda is given the ranking of a 7, and falls into the category of 0-70 (low abrasive). 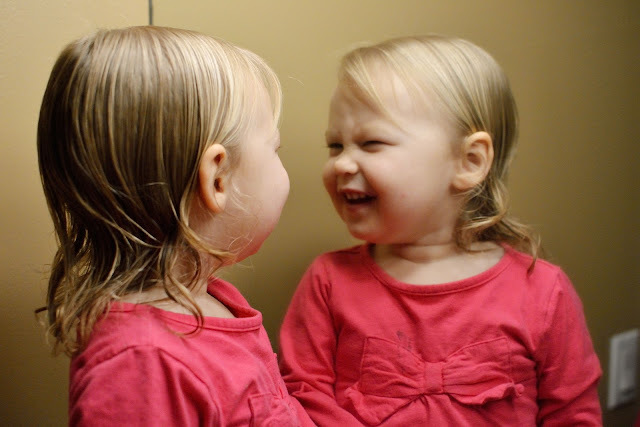 The only toothpaste above it that is less abrasive is something called "Oral Neutralizing Gel." Most common toothpastes are in the range of 49-165, with anything above 150 falling into the category of "highly abrasive". 2. 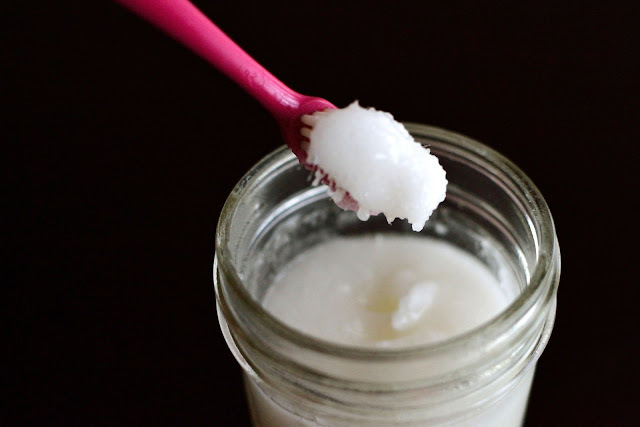 Coconut oil- coconut oil is going to help hold all the ingredients together and on top of that it brings some great qualities to the table in this toothpaste recipe because of it's natural antibacterial and antiviral properties. 3. Xylitol- this is going to be the "sweetener" of the toothpaste because without it we would have one bitter toothpaste on our hands! But aside from giving the toothpaste a sweeter flavor, xylitol has also been shown to help reduce tooth decay and improve overall oral health, read more here. 4. Peppermint extract-this will help give you a little minty freshness after you're done brushing. This specific recipe calls for peppermint extract, like the kind you would find in the baking aisle. I've seen some other recipes use actual essential oils, but then I've heard others say it's not safe to ingest essential oils. Such a debate this world of natural toothpaste recipes, right? It's really up to you and what you feel comfortable with. Now that we know the ingredients let's check out the recipe. Add ingredients to the bowl. When it's smooth and creamy like this, you're done! 1. 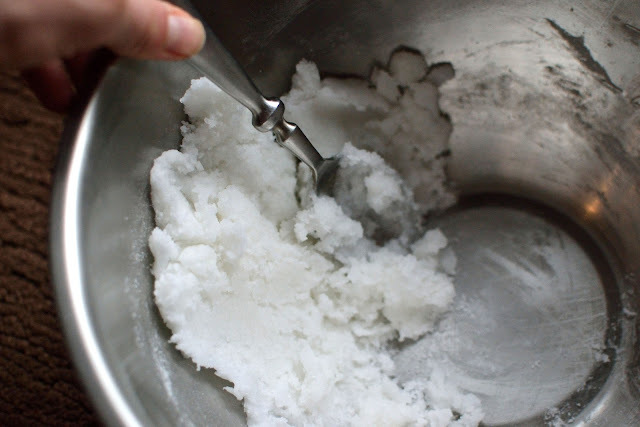 Melt the coconut oil then add it to a mixing bowl with the baking soda, xylitol, and peppermint extract and combine until smooth. It will be much easier to combine. The finished product, transfer to a jar or container. 1. Does this toothpaste really work? Yes! I've been using this toothpaste for probably 8 or 9 months and in that time I've had my 6 month dental cleaning. During that cleaning they do a cavity check, and for the first time in a long time I had no cavities! Usually I'll have one or the beginning of one (despite frequent brushing and flossing). Granted I've also used this toothpaste in conjunction with the practice of oil pulling, which you can read more about here, and I think they both have really improved my overall oral health for the better. 2. 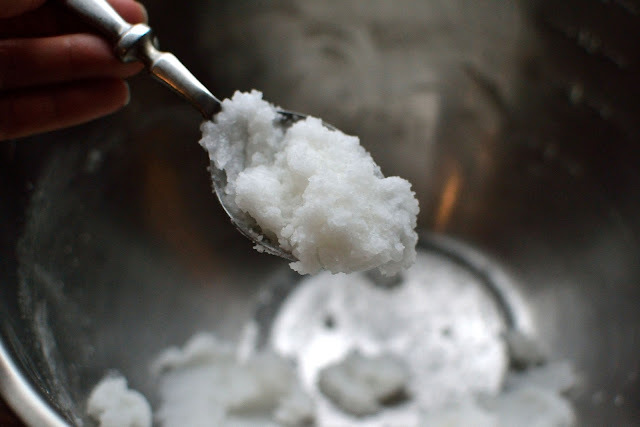 Speaking of oil pulling, do you brush before or after? Ideally with oil pulling, you do that first thing in the morning, before you do anything else, so technically it should be oil pulling first, then you brush your teeth. But life doesn't always work that way. I love to start my day with a glass of warm lemon water, that you may have read about back in this post, and by the time I'm done with that I'm hungry! I don't want to swoosh oil in my mouth for 20 minutes. So I usually eat breakfast, brush my teeth, workout , and then when I go to take a shower and get ready that's when I will do my oil pulling for 20 minutes. So I guess you could say, I brush, then oil pull. But truly as long as you're getting in your oil pulling and brushing your teeth, I don't think the order matters as much. Here I am oil pulling (aka oil swooshing). 3. Temperature change: Just as with my deodorant recipe, which also contains coconut oil, as the temperature changes where you live, the consistency of your toothpaste will also change. We've got good ol' coconut oil to thank for that one, because it is sold at 76 degrees, but anything above that will cause it to start to melt and soften. So as the weather gets warmer, you'll find the toothpaste is softer (as you can see in my recipe pics above), but if the weather or your home is colder, it will harden up and you will have to scrape it out a bit more. 4. Adjusting to the flavor: When I first tried this recipe I was shocked by the bitter flavor...despite putting nearly 10 Tbs. 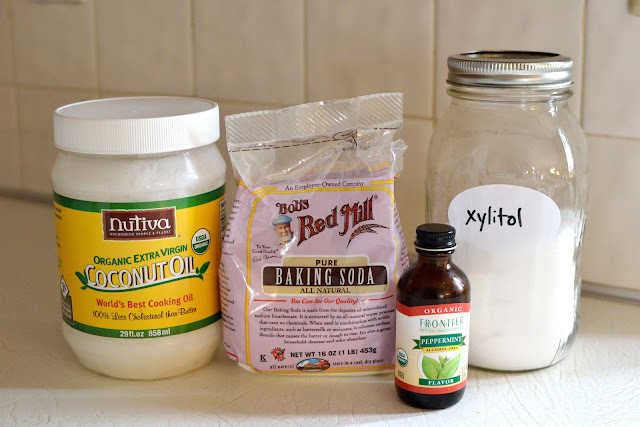 of xylitol (double what the recipe calls for, but you can add extra if you need it). Mainly the shock was just because the flavor was so different from the even "green and natural" toothpastes I had tried before. So, when trying this give it a bit of time for your taste buds to adjust. And trust me, once you feel how clean your teeth are and how fresh your breath is after brushing, you'll learn to love it. I know I could never go back to standard toothpastes! 5. A weird warning...beware of xylitol and dogs, as apparently it can be quite toxic to them. Luckily my dog doesn't care to have anything to do with my toothpaste or toothbrushing routine, but in any case, use caution. 6. How about kids? 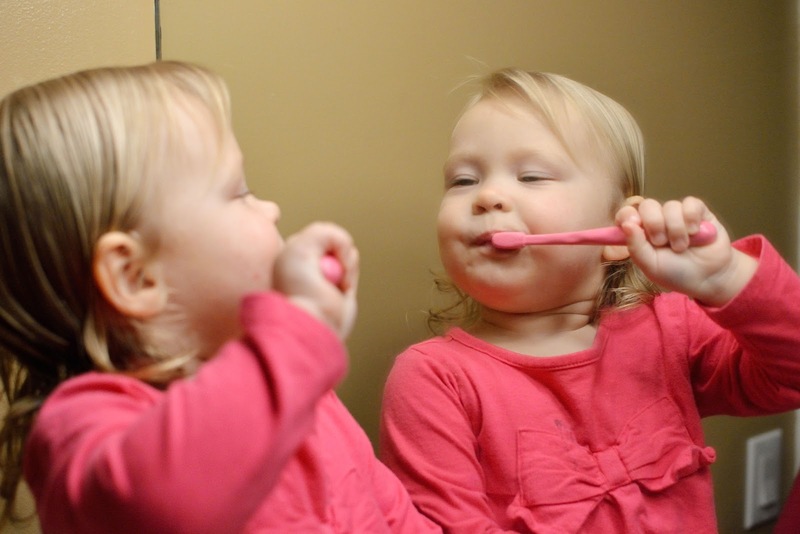 I use this toothpaste recipe with Avery and she loves it. One word of caution I read another blogger say is that baking soda is a high-sodium food so you wouldn't want young children to ingest too much of it, but I'm usually the one who puts the toothpaste on her toothbrush (otherwise she'd take the entire jar) and I make sure she just gets a little bit and that we do lots of rinsing and spitting (though we're still working on that part). (don't worry, we're right behind her). Also, if you're wondering, I use a Preserve toothbrush, kind of a cool green option. Basically they are made from recycled yogurt cups, can be completely recycled (when recycled with their Gimme 5 program), and they are BPA-free. So there you have it, a chance to take your green journey to the next step with a homemade toothpaste recipe! 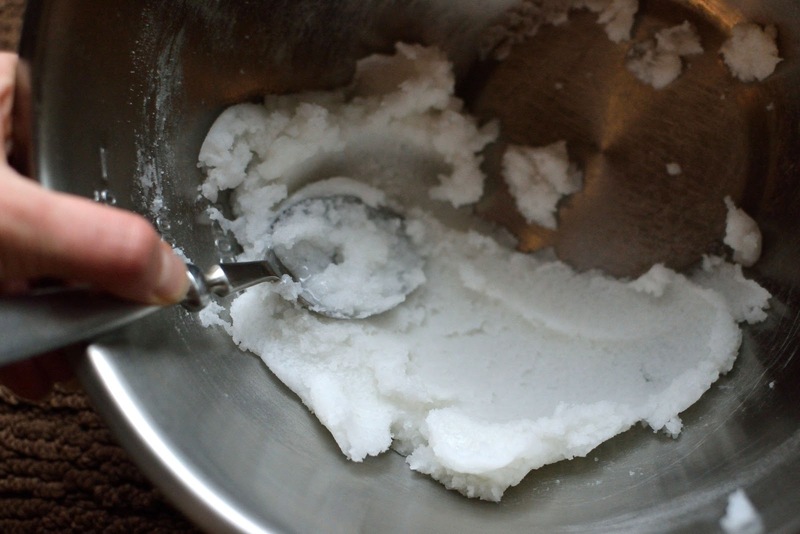 Have you ever tried making your own toothpaste? Or do you have a favorite recipe to share? Post below! I suppose that baking soda is too abrasive for our teeth? It simply damages our enamel, isn't it?